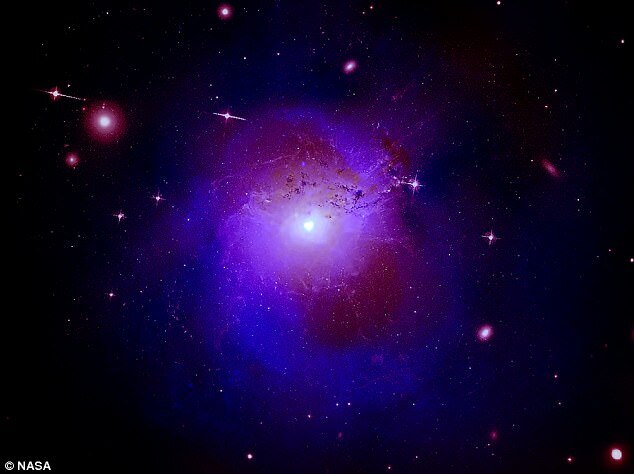 NASA scientists may be on the brink of a major breakthrough in understanding dark matter. By analysing data from x-ray telescopes, they say they may have made a dramatic discovery of an 'energy spike' that could help explain the invisible substance that makes up about 27 per cent of the universe. If confirmed with future observations, the discovery of a 'signature' for dark matter is a major step forward in understanding the strange substance. 'We expect that this result will either be hugely important or a total dud,' said Joseph Conlon of Oxford University who led the new study. This particular method began in 2014 when a team of astronomers led by Esra Bulbul, of the Harvard-Smithsonian Center for Astrophysics, found a spike of intensity at a very specific energy level. That finding was discovered using the Chandra and XMM-Newton observations in the hot gas in the Perseus galaxy cluster. The interpretation of the X-ray data offers a new explanation for a set of results made with NASA's Chandra X-ray Observatory, Europe's XMM-Newton and Hitomi, a Japanese-led X-ray telescope. That spike is at an energy of 3.5 kiloelectron volts (keV). The intensity of the 3.5 keV spike is nearly impossible to explain and therefore a dark matter origin was suggested. But that wasn't their only finding. Bulbul and colleagues also reported the existence of the 3.5 keV energy in a study of 73 other galaxy clusters using XMM-Newton, according to the press release. And just a week after Bulbul's team submitted their findings, another research group reported evidence of 3.5 keV in XMM-Newton observations of the M31 galaxy and along the outskirts of the Perseus cluster. Dark matter is said to makes up roughly 27 percent of the Universe. But, it does not reflect light, making it invisible. 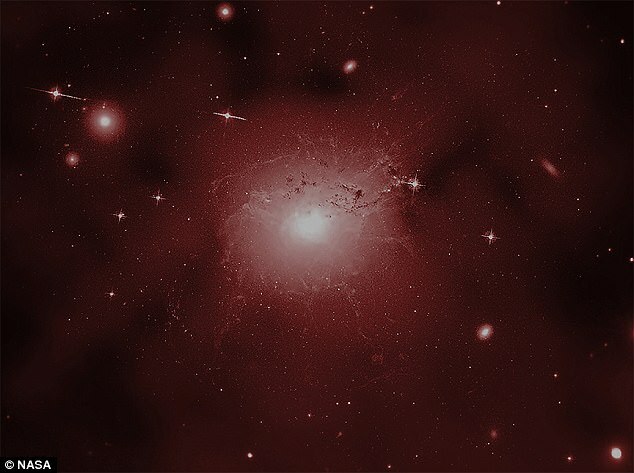 Dark matter is thought to be the gravitational 'glue' that holds the galaxies together, while just 5% the Universe consists of known material such as atoms and subatomic particles. But both groups' findings became controversial when other astronomers failed to detect the 3.5 keV energy when observing other objects. In 2016, the Hitomi X-ray telescope, which is designed specifically to observe keV energy or line emmission, also failed to detect the 3.5 keV energy in the Perseus cluster. 'One might think that when Hitomi didn't see the 3.5 keV line that we would have just thrown in the towel for this line of investigation,' said co-author Francesca Day, also from Oxford. 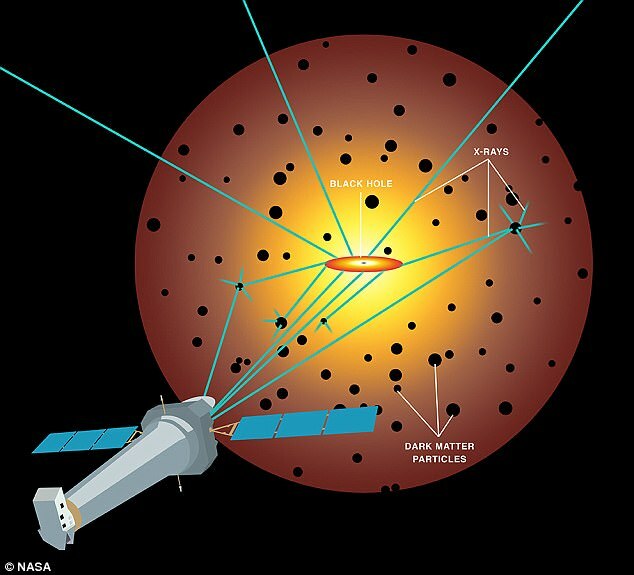 Conlon and his team found that the Hitomi telescope had fuzzier images than Chandra, leading them to believe that its data on the Perseus cluster are actually comprised of a mixture of the X-ray signals from two sources. 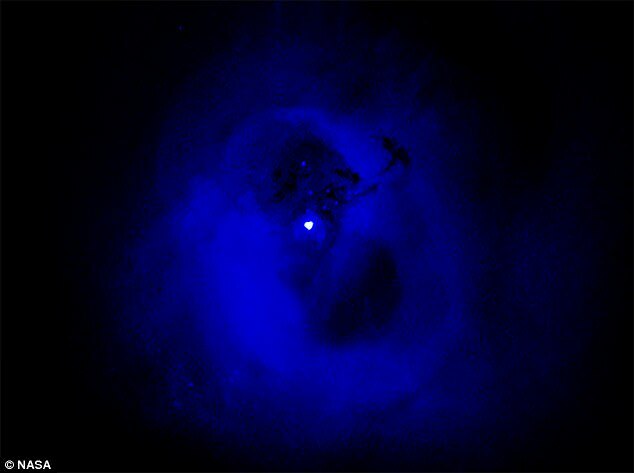 One of those sources is the X-ray emission from near the supermassive black hole in the Perseus galaxy. Since Chandra's vision is sharper, Bulbul capitalized on this and isolated the X-ray signal from the hot gas by removing point sources from their analysis. In order to test whether this difference mattered, the Oxford team re-analyzed Chandra data from close to the black hole of Perseus that was taken in 2009. They discovered evidence for a deficit rather than a surplus of X-rays at 3.5 keV. This suggests that something in Perseus is absorbing X-rays at this exact energy. Oxford's team suggests in their report that dark matter particles may be like atoms in having two energy states separated by 3.5 keV. If so, it could be possible to observe an absorption line at 3.5 keV when observing at angles close to the direction of the black hole, and an emission line when looking at the cluster hot gas at large angles away from the black hole. 'This is not a simple picture to paint, but it's possible that we've found a way to both explain the unusual X-ray signals coming from Perseus and uncover a hint about what dark matter actually is,' said co-author Nicholas Jennings, also of Oxford. As astronomers move forward, they will need more data and further observations of the Perseus cluster and others like it. Chandra, XMM-Newton and future X-ray missions will continue to observe clusters to address the dark matter mystery. Dark Matter, like epicycles, exists in the imagination of so-called "scientists" (abstract mathematicians). Want proof? Please investigate www.thunderbolts.info and see for yourself! It's real science from plasma physicists!! !